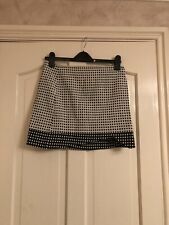 Topshop Skirt 10. Condition is Used. Dispatched with Royal Mail 1st Class. LENGHT AT LONGEST POINT: 17". Washed and ready to wear. 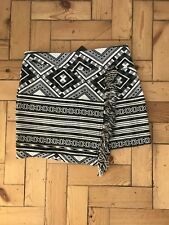 Topshop Size 12 Black Asymmetric Mini Skirt. Never been worn before Perfect office wear or just for a smarter look. Dispatched with Royal Mail 2nd Class. Purple wool blend. Size 12 UK. Back zip fastening. Topshop faux leather skirt in beige. Aline design on front. Elasticated waist with rouched detail. Perfect condition. 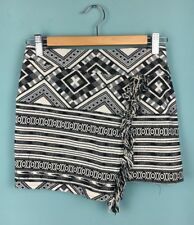 Would look great with tights and a baggy jumper on a cold day, casual with a white T-shirt and denim jacket when it warms up or can easily be dressed up for a night out. Team with a plain tank and heels for the ultimate chic party outfit this season! Silky feel mini skirt with silver zip detailing. Longer silver slip undoes to put the skirt on. Size UK 10. Gorgeous skirt. Bought for £29.00 in January. Too late to take back. Topshop zip front Skirt lovely zips up at the front new with two side pockets. Dispatched with Royal Mail 2nd Class.